102 mm/40 PIX3 х 1 pcs. Initial HE Shell Velocity664 m./s. Initial AP Shell Velocity664 m./s. 40 mm/39 QF Mark II3 х 1 pcs. Phra Ruang — Pan-Asian Tier III destroyer. Formerly HMS Radiant of the British Navy, she was sold to the Royal Thai Navy in 1920 and renamed. She could travel at a very high speed and carried very good armament. For most of her service life, she was the most powerful torpedo ship in her country's service. Tier III's Phra Ruang plays very similarly to her predecessor Longjiang, and shares many of the same strengths and weaknesses. Phra Ruang’s torpedoes are quite good for her tier, and will inflict heavy damage upon the cruisers and battleships — and occasional aircraft carriers — she encounters; unfortunately, as deep water torpedoes, they are useless against smaller enemy units. This means she must rely upon her main battery when in close combat with opposing destroyers. Her 102mm guns are adequate, but not exceptional. At point-blank ranges (~5.0 km or less) they are good enough for self-defense, and fire quickly enough that they are likely to discourage enemy destroyers from pushing closer. Shell flight times out near her maximum range of 8.7 km, however, will make hitting anything but slow-moving battleships very challenging. 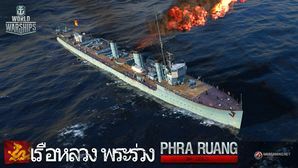 Phra Ruang captains should use her stealth and torpedoes to make quick work of enemy battleships and avoid engaging enemy destroyers at all costs. Her stealth makes her an excellent ship to capture control points in, as long as captains have a pre-planned exit strategy if spotted. Aggressive captains may feel comfortable taking on wounded destroyers — or hiding in a bank of smoke to harass enemy capital ships — with her main battery; this is a valid tactic, of course, but given her very low health pool (second-lowest at Tier III) the price for getting spotted is likely a quick trip back to port. Lowest detection range of all Tier III destroyers. Capable of delivering torpedo strikes from beyond detection range. Torpedo reload is relatively quick. Torpedoes are not useful when engaged in close combat with other destroyers. Main battery shell velocity makes long-range gunnery very difficult. Exceedingly fragile, Phra Ruang combines a low health pool with non-existent armor. Hull: Upgrade to Hull (B) for additional health, a touch more AA, and a quicker rudder shift time. Research of this module unlocks progression to Shenyang. Gun Fire Control System: Upgrade to Mk III mod. 2 for an extra 10% range on the main battery. The Hull (B) upgrade is really the only place to invest experience gains; given her shell performance, captains are encouraged to simply ship the GFCS upgrade and move on up the tech tree. Captains without Juliet Charlie ( ) flags to use are strongly encouraged to equip Magazine Modification 1 in Slot 1 instead. Key skills for Phra Ruang commanders include Last Stand, Survivability Expert, and Concealment Expert. It's difficult to recommend investing skill points into buffing her main battery via Advanced/Basic Firing Training or Demolition Expert, but it's all she can rely on when up against enemy destroyers and may be worth sinking some points into for highly aggressive captains. Captains wishing to maximize their survivability are encouraged to invest credits (or doubloons) in Smoke Generator II ( ). The two best flags to equip on Phra Ruang are Equal Speed Charlie London ( ) and Red Dragon ( ) in order to quickly advance up the line. Sierra Mike ( ) is always a good idea for a destroyer, though Phra Ruang is already the fastest destroyer at Tier III. Zulu Hotel ( ) and/or Dragon Flag ( ) will help captains advance towards that crucial Level 4 commander skill more quickly. Phra Ruang waits patiently for her prey. Phra Ruang anchored near the royal palace. Crew of Phra Ruang, circa 1934. Phra Ruang, date and location unknown. Phra Ruang. 29 November 1955. One of Phra Ruang smokestacks. Original wheel of destroyer Phra Ruang. Ship's bell of HMS Radiant. Commemorative stamp depicting Phra Ruang. This page was last modified on 24 April 2018, at 22:12.